Ending this year with one of my favorite dresses at the moment! Though I am rather fond of little black dresses in general, the one I’m wearing in today’s post is just on another level for me! Truly, I couldn’t tell you what is it that I love most about it: the one-shoulder neckline, the rich velvet fabric or the crystal embellishment, but combined together, all of the above sure make for one magical dress! Yet another reason why this dress goes down in history as one of my all-time favorites is the shape. Though it is certainly decidedly feminine, it also has that distinct edgy and strong vibe that Saint Laurent does so well, and it is this particular quality that makes this velvet number a bit of a chameleon. So good with heels and a little clutch, I also love pairing it with over-the-knee boots or flats for cocktail hour. Last but certainly not least are the pockets. I mean, you know how I feel about pockets on dresses in general, but pockets on cocktail dresses happen to be my particular weakness! Why the obsession? 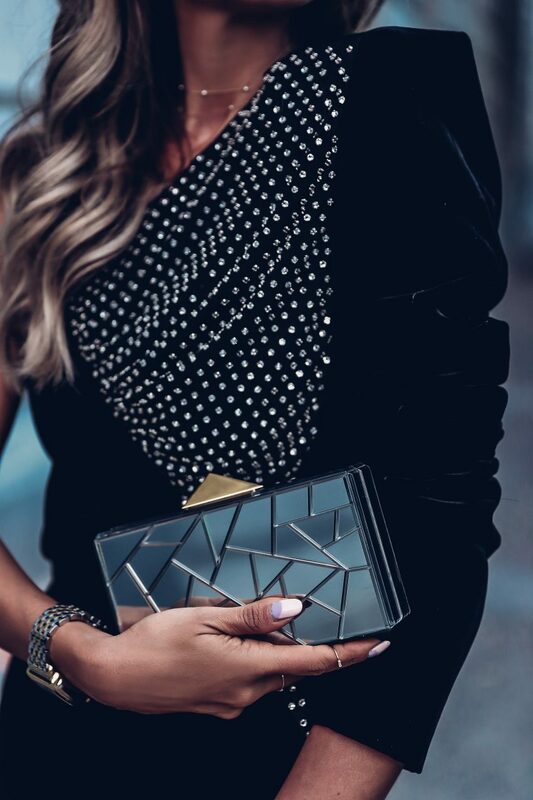 Well…, really it’s the kind of detail that adds that slight casual/edgy vibe to an otherwise very dressy number, and when it comes to clothing, I really love pieces that combine both dressy and casual elements. What about you guys, what do you look for in a cocktail dress? Sequins For Day... Why Not! Such an awesome look, so stylish! Your dress looks amazing! I always love your style! Oh my, I’m completely speechless!! This outfit is to die for and SO perfect for NYE celebrations! In love with the twist on this LBD. It’s such a stand out piece! You look absolutely stunning in this dress! Lovely details! Have a great New Year! Gorgeous dress! A LBD is always a good cocktail dress option. This dress was simply meant for you, how gorgeous !! !